Last night, I photographed the men of USA hockey at their press conference. I was hoping that I could crank those out so that I could go out to the park and take some night shots of the venues. That started at 5:15pm, and by 6:15 I had finished shooting the images, editing them and sent them back to the US. the venues. The key to good night shots is to catch the right weather and to be there at the right time of the evening. I planned ahead for this shoot, checking my Sunset app on my iPhone to see that sunset was at 6:45pm with the best light around 7pm. I took my Gitzo tripod and mounting plates with me for the morning trip to the main press center. The weather in the morning was not very good, with a light rain and a little wind. I figured that, as long as it was not pouring, I could still get decent shots, or maybe work off the reflections on the ground. But, as it turned out, the weather cleared nicely, leaving it dry and giving me some nice clouds to work with. Thanks mother nature! This is the Bolshoy Ice dome, where all of the men's hockey will be played. The women's gold medal round will be played here as well, and I hope that Team USA is part of that. This will be my home for the next 2 weeks as I wrap up the women's hockey and start shooting the men. Everytime I walk by this venue at night, I think "I need to shoot this at night". Glad I did that. I shot this with the Canon 1DX, Canon 24-105 lens, on the Gitzo tripod. I almost always do my night photography at ISO 100 to get the cleanest images. I set the aperture at f11 to get a 3 second exposure. This gave me a nicely focused image and also created some motion blur in the people in the foreground. The Bolshoy Ice Dome in the background, behind the base of the Olympic flame. This is the medal plaza where all the athletes get their medals. You probably noticed that they have a flower ceremony at the event venue, and then wait until the next day to present their medals to them in the Olympic Park. I shot this before the ceremony started, but was happy to see that this area filled before it began. As I was walking the park, waiting for the best light, I saw the Olympic flame reflecting off of the Iceberg Skating Palace. I took this photo to remember the moment. I am not really loving this shot, but wanted to show it to all you to remind you too look around you for the "less obvious shot". I think I was the only person photographing in this direction. A little later in the evening, this is the Iceberg Skating Palace full lit. Pretty dramatic. For the first time in a week, I ventured to the back of the Olympic Park, where they have the main store (pictured here) and all the "houses". For those of you who have never been to an Olympics before, many of the countries will have their own "house" where the athletes can go and hang out and relax. The house is rarely open to the press and is designed to be a peaceful hang-out area for the team members and VIPs. And of course, they have their stores where you can purchase team apparel, pins, and other goodies. As I was walking out to the park, after shooting at the MPC, I made a photo plan in my head. They key shot would be the Olympic flame, and this is where I would position myself for the best lighting. I started shooting at 6:55pm, about 10 minutes after the sun had set and got this shot. It is pretty nice, but not what I was looking for. I needed to wait for the sky to darken, so that I could see the lights on the building better. And then, at 7:08pm, the sky had darkened, but left some of the yellow sunlight, and I took this. When I looked at the LCD of the camera, I knew that this was going to be one of my favorite photos. People sometimes ask me if I know this when I am shooting. Sometimes you find a great shot when editing, and sometimes you just know you got it. I was happy. Oh, the settings were ISO 100, f/16, 1.3 sec, with -0.7 exposure compensation. Once I felt that I had the other shot completed, I quickly walked around to shoot other angles of the flame, while I still had the great colors in the night sky. I have photographed these rings during the day, but I find this shot of them, with the Bolshoy lit in the background, to be so much more interesting. I moved slightly to position the Olympic flame in one of the rings. It is an OK photo. Not great, but worth a try. The great thing about digital photography, is that you can try different things and they do not cost you anything. Here is the Fisht Olympic Stadium, which won't be used again until the closing ceremony. This was taken at 7:33pm, and you can see that the deep blue sky is gone and now I am shooting with pure black skies. It isn't bad, but it isn't nearly as dramatic as the earlier skies. Another view of the Iceberg Skating Palace. I really like the colors of this building. This is the entrance area for the spectators. But to me, this is the farthest point from where I come in, since the media entrance is on the exact opposite side of the park. Here is something I find interesting. Even thought there are more than 1,000 photographers here, I think I am one of the only people who have captured the venues at night. We tend to get so consumed with the sports and action, that we forget about the other photo opportunities. I was talking with some photographers late last night and we were talking about our best images of the day. They asked me which sport was my best, and I said "no sport". They looked at me funny, until I showed them a couple of the images on the back of the camera. 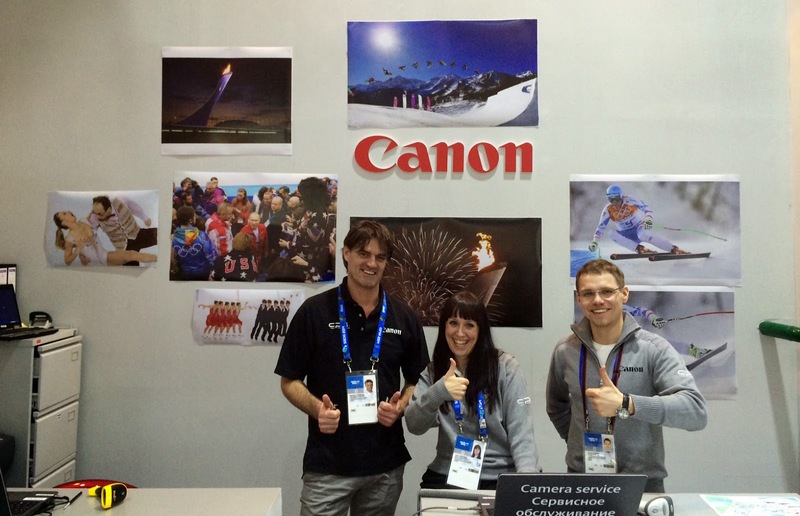 And....the people at Canon liked it so much, it made the wall in the press center. Fun stuff. As always great photo's. Your not doing the norm ie: taking pictures of venues at night, is why you deserve the GOLD metal of Olympic photographers. Funny you mentioned trying something and it not costing anything with digital camera's. I just told my mom that about some pictures I took that wasn't that happy with. Looking forward to your hockey pictures. As usual, awesome shots Jeff. It must be a rush to cover the Olympic Games. Thanks for sharing more than the photos. Describing your experience adds an entire different perspective to the photos. As usual, awesome shots Jeff. Thanks for sharing your experience together with the photos. It adds a different dimension to what we're looking. Great work Jeff! Love all you're photos an especially your comments. I'm an old enthusiastic amateur in Eastern Canada. Keep em'coming!! Thank you for sharing with us. God bless you. Congratulations on making Canon's wall at the games! Your shots are fantastic; and, your blog about them is extremely interesting and informative. I look forward with anticipation to seeing your posts. Thanks! This gives me a better perspective of what it is really like there. I love the night time images. They are fantastic. Thanks Jeff! Love seeing the non-sports shots too! 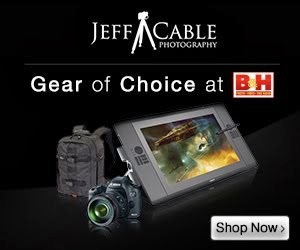 Jeff, I[m enjoying your blog. Great to see how you are approaching the event, great shots. Keep it up! Thanks. Although I'm not at the Olympics to take photos those hints can be used anywhere. Any chance of getting a full frame shot of that colorful and decorative wall under the Bosco sign on the main store? Really enjoying your shots. I am a budding photographer and thanks for the input on your settings. Those night shots are great. The Olimpic flame with the blue and yellow sky on the back is beautiful. Thanks for evrything and be safe.